Celebrating the life of Dearl Arnold Morrow, Sr.
Be the first to share your favorite memory, photo or story of Dearl. This memorial page is dedicated for family, friends and future generations to celebrate the life of their loved one. 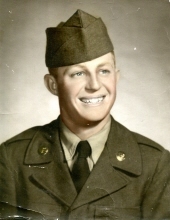 Obituary for Dearl Arnold Morrow, Sr.
Dearl A. Morrow was born June 10th, 1933 to William and Tulah Morrow in Binger Oklahoma. He passed away Tuesday November 13th, 2018 at Sutter Coast Hospital. He married Margie LaFazio on October 31st, 1953 in Reno Nevada. He was then drafted in the U.S Army and served in the Korean War. Dearl and Margie were married 65 years and raised 4 children together. He worked for Simpson Timber Mill in Klamath CA and spent most of his career logging for McNamara & Peepe and Wayne Bear. Dearl is survived by his wife Margie, daughter Terry Edwards, son Chuck (Maggie) Morrow, daughter Rhonda (Donnie) Edwards and son Butch (Corky) Morrow, 12 grandkids and 23 great-grandkids. He is also survived by sister LaVerne Shandrew, sister Ellen (Frank) Petty, brother Willard Morrow and brother Billy (Linda) Morrow and many nieces and nephews. He was proceeded in death by his parents William and Tulah Morrow, his sisters Christine Kinder and Ealline Carter, son-in-law Larry Edwards, grandson Nicholas Webb and his dog Molly. Dearl loved his family, the 49ers, Tiger Woods, game shows on mute with subtitles or turned up to 100, crossword puzzles, nights at the Casino, feeding stray animals, stepping on snails and chocolate! He was a lifetime member of the VFW where he enjoyed visiting with friends and telling stories. Dearl loved a good time, a good laugh and big family gatherings. He will truly be missed by family, friends and all that knew him. In lieu of flowers, family is requesting contributions may be made in Dearl’s memory to ASPCA at www.aspca.org. To plant a tree in memory of Dearl Arnold Morrow, Sr., please visit our Tribute Store. "Email Address" would like to share the life celebration of Dearl Arnold Morrow, Sr.. Click on the "link" to go to share a favorite memory or leave a condolence message for the family.